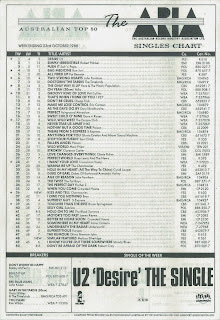 After the flood of new entries last week, it was a quiet chart this week in 1988 - and it couldn't have come at a better time for me since I'm currently overseas. Don't worry, I'm not skipping sightseeing to blog - I wrote this up before I left. Before we check out the two - yes, just two - new entries, there was cause for celebration with U2's "Desire" dethroning Robert Palmer's "Simply Irresistible" from the number 1 spot. The Irish band would have to wait a couple more weeks for a number 1 album with Rattle & Hum, but last week's other returning band, Bon Jovi, went straight in at the top with New Jersey (while "Bad Medicine" shot up to number 4 on the singles chart). Two years after they last graced the top 50, Spandau Ballet returned with a song that'd end up on 1989's Heart Like A Sky. 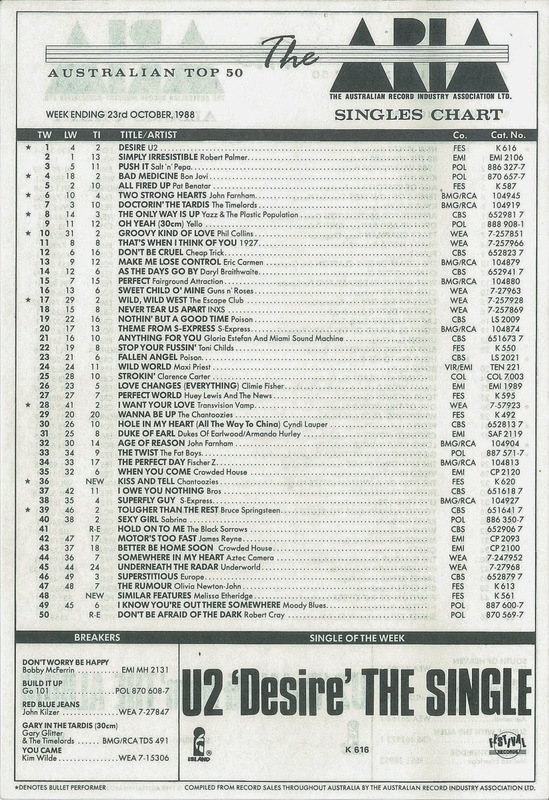 Featuring another shift in sound, "Raw" would be the band's final top 100 appearance. I have to say I was not a fan of this debut single by the singer/songwriter who'd end up having quite the career - but Australia was, giving Melissa her first top 40 hit anywhere in the world. In fact, "Similar Features" would only creep into the Billboard Hot 100 in April 1989, by which time Melissa was already a big success here. This fourth and final single from their debut album would be Chantoozies' last top 50 appearance as an eight-piece. By the time they returned to the chart with a cover of "Love The One You're With" in 1991, the group had shrunk dramatically to just a trio: Eve von Bibra, Angie La Bozzetta and Ally Fowler, who was mostly absent from the "Kiss 'n' Tell" clip due, I believe, to illness on the day of the shoot. Next week: the debut of my most hated song for 1988 (boo! ), but it's made up for by three new hits from some of my favourite acts (hurray!). For some time, I thought that Melissa Etheridge was an Australian artist. Fox FM in Melbourne sure gave the 3 singles from her debut album heavy rotation. I was quite surprised to find out later on she was American. If I remember correctly, the video for Similar Features had not yet been made when it was in the top 50 here. I remember catching it for the first time on Video Hits around mid 1989, billed as a 'hit prediction'! Interesting to see that ARIA have listed Chantoozies as 'The Chantoozies' for Wanna Be Up, but not Kiss 'n' Tell. I've found so many mistakes doing this blog - lots of The where they shouldn't be one and vice versa. The worst errors were the incorrect title for Elton John's "I Don't Wanna Go On With You Like That" and the incorrect weeks in tally for "La Bamba".